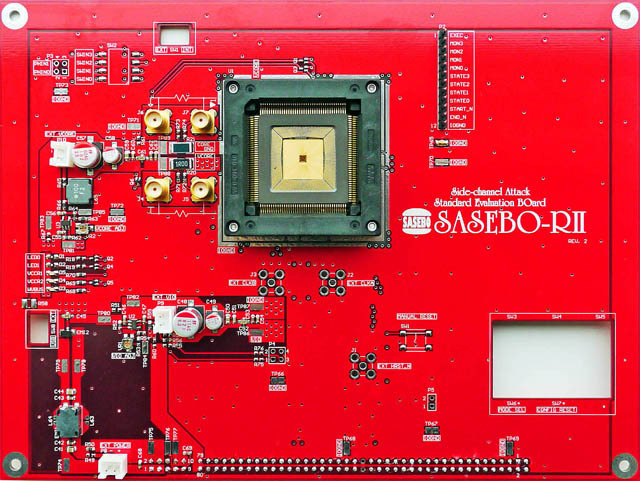 SASEBO-RII is a doughter board on SASEBO-W. SASEBO-RII has a 160-pin QFP LSI socket for a cryptographic custom LSI that is controlled by the Xilinx® Spartan™-6 (XC6SLX150) FPGA on SASEBO-W. This board was developed by AIST in a research project supported by JST/CREST (Japan Science and Technology Agency/Core Research for Evolutional Science & Technology). Design data of SASEBO-RII can freely be modified and used to develop an orinal LSI board in rearch pourpose but not in commercial use.